These are similar to luchis in that they are deep fried puris packed with a moreish, green peas filling. Best eaten to hot aloo dum made with baby potatoes in a spiced tomato gravy. The queues for mochar chop, made with tender banana flower, are as long as those lined up for fish chops. These delicately flavoured cutlets taste great with kashundi or traditional Bengali hot mustard sauce. Don’t confuse beguni with begun bhaaja. While beguni is a delicate batter fried piece of brinjal, begun bhaaja is a fat roundel of brinjal, coated lightly in turmeric and shallow fried in mustard oil. Beguni is usually served with the bhog (lunch, which is usually served for free at most pandals. Some stalls also sell bhog meals) and you can never eat just one since it is the perfect accompaniment for warm khichuri. 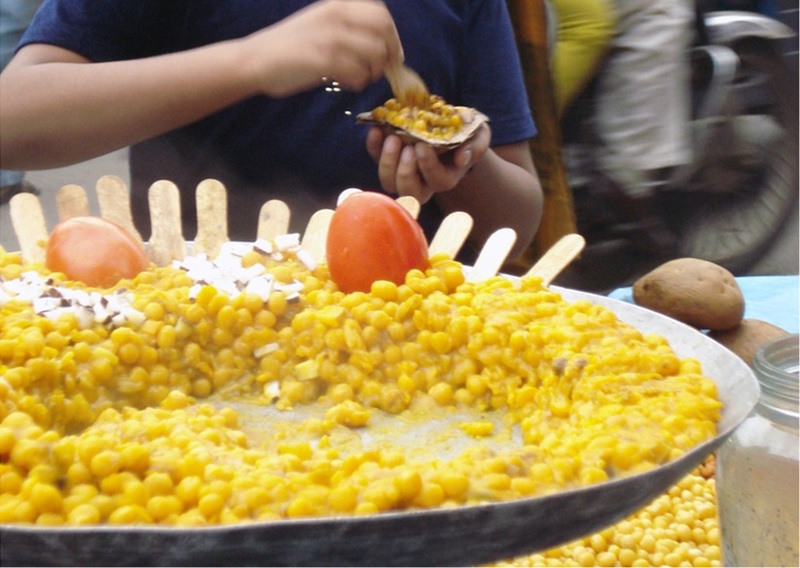 A popular street snack in Kolkata, the ghugni is to Bengalis what ragda is to Gujaratis. A simple dish made of dried white peas, green chillies, ginger and muri masala (roasted cumin seeds, coriander seeds, dried red chillies, bay leaves, amchur, rock salt ground to a fine powder), ghugni is usually eaten on its own, and some serve it with boiled eggs. When made at home, it’s even served with luchis. At the pandals, you can pick it up with either luchis or chops (cutlets). This is also a Sunday breakfast favourite at most Bengali homes. Radhaballabhi is yet another fried delicacy made with a filling of spiced split black lentils. It is served either with chholar dal (split Bengal gram) or alu dom. While there’s an irresistible spread of sweets including sandesh and rasgulla, filled with the goodness of nolen gur or the date palm jaggery that Bengalis love so much at the pandals, if you’ve never tried the channar payesh, this is probably the best time. Thickened milk slow cooked with milk solids or khoya and chenna or paneer make for this incredibly smooth dessert, which is as comforting as the softest pillow you’ve ever laid your head on and you’ll be ready to hit the snooze button as soon as you end your meal with it. It’s usually served chilled and is also a great way to cool off after all this food.